Since 20 December 2018 a total of 59 214 tickets were sold with 743 tickets of these tickets resold on the integrated secondary market. 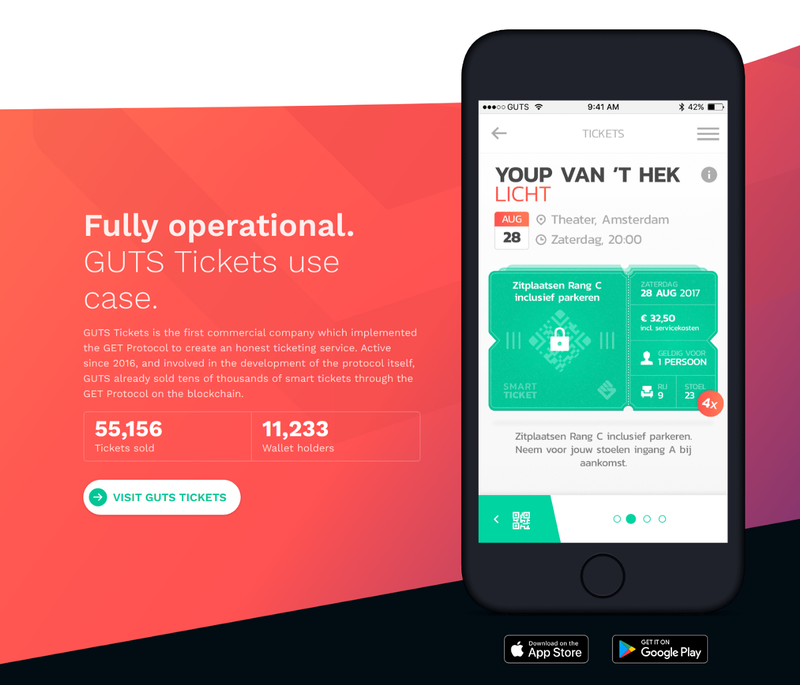 In order to fuel the blockchain component of these tickets with the required GET to operate on the GET Protocol, GUTS Tickets will conduct a buyback totaling worth €36,055.40. This buyback amount is equivalent to $40,745 or ₩ 46,275,511. The Q1'19 buyback is the largest buyback to date. The first price tranche of €0.50 / GET will start at 14:00 (2 PM) local time on the 27th of March (Amsterdam +1 GMT — 1553691600). The buyback will end when the full order of €36,055.40 in GET has been filled by the open market participants. Assuming all the details and rules of the buyback are clear to the reader, this article will proceed in listing the concrete GET demand, lock and times. The GET that will be bought back during the buyback on March 27th, will be used to fuel the tickets of 132 events that where sold in Q1 of 2019. Check out the ETH-runner registering the ownership of tickets issued by GUTS Tickets in real time: Etherscan. On 27th of March in universal epoch time: 1553691600000 the buyback method will start accepting GET swaps for the base swap tranche. In order to find the accurate market price per GET the auction will increase the swap rate/price in steps after the auction has started. The increasing swap rate will continue until the demand of the buyback is filled (so until all the ETH in the buyback is swapped for GET). Note that due to how time zones work the buyback will start at 14:00 (2 PM) in the Netherlands, Amsterdam time zone(+1 GMT). Note, the exact and final details on the ETH/GET swap rates (or the price schedule) will be made public by blog on the 25th of March. The tranche address, the Ethereum address participants have to send GET to in order to bid in the reverse Dutch auction will be made public on the 25th on the get-protocol.io website. ONLY USE THE ADDRESS AS FOUND ON THE OFFICIAL WEBSITE OF THE GET-PROTOCOL(https://get-protocol.io/). In total €36,055.40 worth of Ether will be swapped for GET. At current ETH prices, this would be equivalent to 300.2 ETH worth of GET that will be acquired from the open market starting from 0.00416666666 ETH/GETuntil the demand is filled by the open market. The amount of GET that will be bought is decided by the open market participants by means of the reverse Dutch auction price discovery. How much GET is going to be required per smart ticket depends on the average ETH/GET as is discovered during the auction. Participating in the GET Protocol buyback auction is completely at the participant’s own risk! Only trust information given in official GET Protocol channels, such as the website and blog. Always double check the tranche address! Make sure you fully understand the terms and rules of the auction BEFORE you participate. Participating is final, after sending GET to the tranche address you cannot cancel or make ‘changes’ to the GET transfer. All GET sent to the buyback address that was too late will be returned to the sender within 72 hours of the auctions close. Be aware of this latency! Review the blogs going into depth on the buyback method if you want to know more : 1, 2 and 3.